Well, I for one can’t wait to see the outcome of Christie’s next watches online auction. They’re going to be featuring three limited edition Omega Seamaster Diver 300m Commander’s watches. All proceeds from the sale of the three timepieces will be going to charitable organisations, UNICEF, the United Nations Mine Action Service, and various other charitable organisations. The Omega Commander’s Watch if officially produced in association with the James Bond Franchise making it a well sought after timepiece. This model features the Royal Navy’s red, white and blue ensign colours. Powering the timepiece is an Omega Calibre 2507 movement. This is a self-winding chronometer movement with a Co-Axial escapement and rhodium-plated finish. In the design, the rotor has been given a James Bond-inspired aesthetic. It has a power reserve of 48 hours when fully wound. The dial is finished in a polished white ceramic with faceted blue skeleton style hour and minute hands. One of my favourite little details for this special edition James Bond Omega watch is the use of the 007 gun logo as a counterweight on the central hands. you’ll also notice the number 7 in the date window is coloured in red. The Omega Commander’s watch comes on a fiver stripe NATO strap in red, blue and grey with an additional metal bracelet. The stainless steel version that’s available is limited to just 7,007 pieces (see what they did there). The 18ct yellow gold model is limited to just seven pieces, and one unique version was created with 18ct white gold. Christie’s will be auctioning off one model in stainless steel one 18ct yellow gold model (number 007) and one unique 18ct white gold. Each James Bond Omega watch will be auctioned off with a unique piece of memorabilia from the films. The stainless steel and yellow gold Seamasters will be offered up for auction with the replica Navy uniforms that were worn by Sean Connery in ‘You Only Live Twice’ from 1967 and Sir Roger Moore in ‘The Spy Who Loved Me’ in 1977. Both these items will be signed on the inside label in gold pen by the producers Michael G. Wilson and Barbara Broccoli. 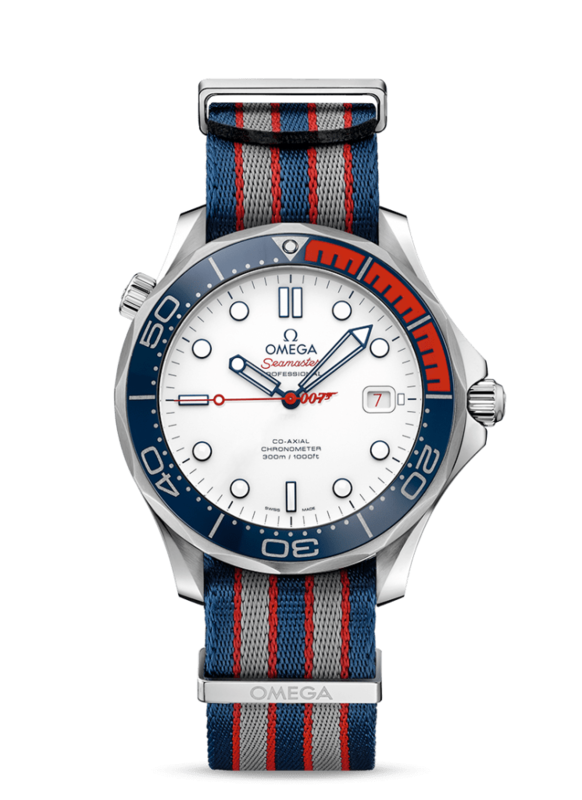 The white gold Omega Seamaster is going to be offered up for auction with a British Royal Navy flag that appeared in the 2015 Bond film Spectre. This will be signed in black pen by the current actor who players James Bond, Daniel Craig. This is set to be a very exciting auction, and with the proceeds going to charity, I can’t wait to see how much is raised from these stunning luxury timepieces.